Hi there!!! 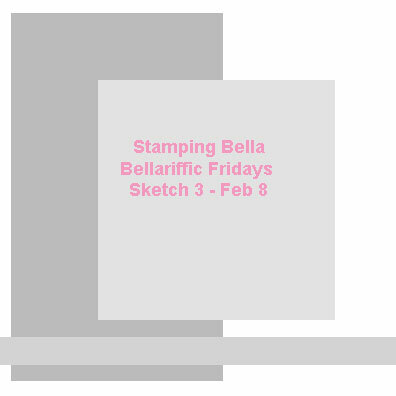 I'm here with my first February post for Stamping Bella. February??? I can't believe it!! This week, the Bellarific Friday challenge is "You are so Sweet". There are so many ways to interpret this challenge and of course, I decided to let my sweet tooth guide the way. For my card, I decided to use "Addy'tude is a Cupcake Diva" that I've had in my stash for quite some time. Addy was stamped in Versafine Onyx Black, embossed with clear embossing powder and then watercolored with Tombow Markers. I've added some Diamond Stickles to her earrings and some red pearls to the cherries on the cupcakes. The layout for my card is the current Freshly Made Sketch challenge (although I did take a liberty or two with the banner placement). A few notes :-) They're good ones too!!!! Emily is making way for some new product so a bunch more stuff has been placed in the Specials section. To top it off, there is also a coupon code for this weekend (Friday Feb. 1 to Sunday Feb. 3) to give you 15% off regular and sale priced items. The coupon code is ineedtopurge2013. Next week's challenge is a sketch!! My fave of all. Email your entries to Emily at Stamping Bella by the end of Thursday February 7th to be in with a chance of winning some Bella Bucks. I am fascinated by the depth of color you achieve on your images and the intensity of color. Well that Addy is a hoot! Cute card! Thanks for joining us at FMS! How fun is this! She looks like she's struggling between loving those cupcakes and hating them! 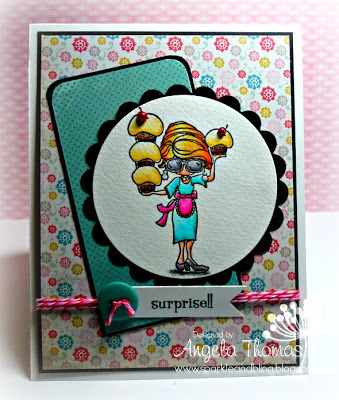 Thanks for joining us at Freshly Made Sketches with such a fun card! Too cute!! Love your coloring on her...fantastic. Glad you joined us this week at FMS!